Thank you to all our fantastic team who helped put this one together. We had a blast with this amazing surprise for a beautiful couple - we love turning visions into reality! 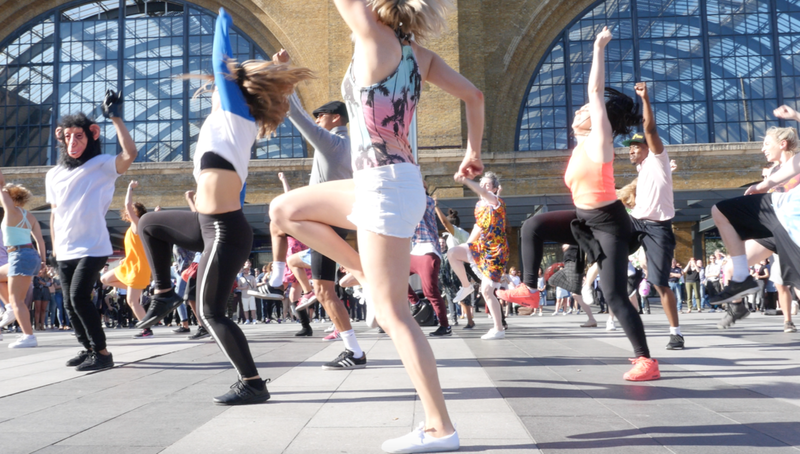 Contact our amazing creative team today if you’d like to create a brilliant surprise for a loved one, or for a publicity stunt - and if you’d like to get involved yourself, sign up to our list on our previous blog post about how to be in a flash mob! Boy, do we have an exciting opportunity for all you flash mob lovers out there! We are looking for volunteers for an incredible, unique flash mob, to be held on the 24th February! This is going to be unlike anything we’ve ever done before - and we would love YOU to be part of this special moment. We can’t disclose all the details publicly for obvious reasons… but this surprise is for a very lovely person - who wants to propose to his partner in a incredible way. There’s no dancing or singing involved with this…our team are co-ordinating a large group of people to stand still at a specific London location, at the exact minute they met - to represent time standing still! - as the proposal happens. Being a part of any proposal is pretty magical, but we think this one is going to be something truly special. Our highlights from 2018 including some of our sweetest proposal moments! If you are free and interested in getting involved on the 24th February in Central London, please let us know asap! The deadline for signing up is the 20th February 2019, and we’ll send you the specifics via email. Also, if you know anyone who would like to be a part of this beautiful moment, please send them our way!. We are looking for around 20-25 volunteers for this unique moment, so get in quick to nab a space! Thank you! Your submission has been sent and MJ from the Club Mob team will get back to you very soon. Our trip to Portugal was one of our highlights! It's been a CRAZY year here at Club Mob! Our third year surprising the UK and further afield has been incredible, smashing all targets, and we've been able to get even more creative than ever before. We've loved every second of it, and to celebrate the New Year, we've reflected and given awards to our top surprises! Enjoy! We work with some absolutely lovely couples, but the award for the sweetest couple of all, goes to Maung and Thu. Maung wanted to use a Burmese song from their past in the proposal, so we decided to add a romantic violin and some lyrical dancers. Thu had no idea it was all for her... until all her family and friends appeared, and Maung, who'd left earlier to pop to the bathroom, was waiting in a suit, ready to propose...it was truly magical. 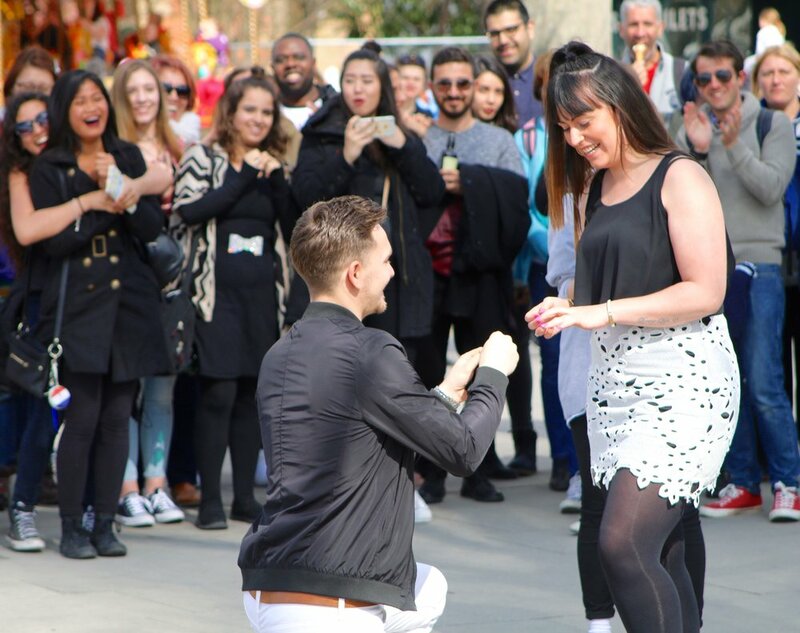 If you like this surprise, check out our runner up for this category - Bhav and Tina's proposal outside Harrods was a stunning performance and draw huge crowds, well done Bhav!! 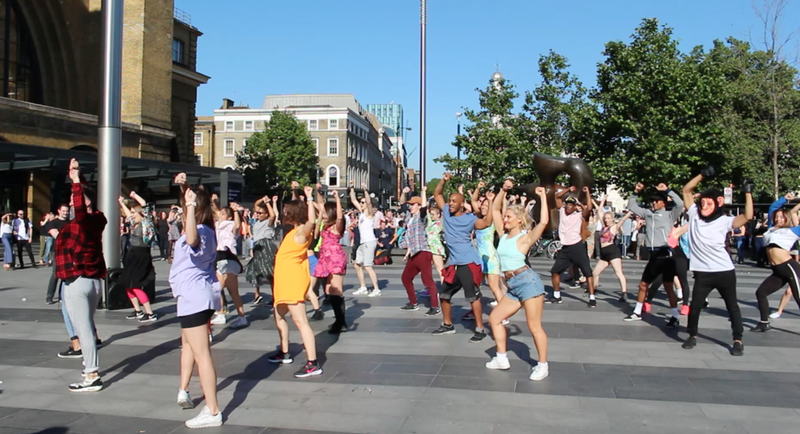 The BIGGEST FLASH MOB of 2017 - SPACE APE GAMES AT KINGS CROSS! So much fun. Soooo much fun. 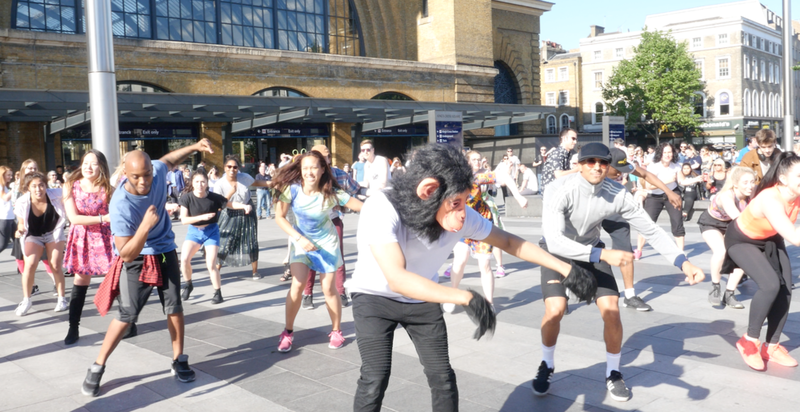 Our biggest flash mob of the year, with 20 of our professional team joined by about 10 of the Space Ape Games team and even some members of the public who we'd enlisted to fulfil their bucket list flash mob aspirations! We don't have a standalone video of this one but it's featured in our compilation we released earlier in the year...watch out for the dancing monkey, that's the one! The MOST FUN Flash Mob of 2017 - MONT ROSE COLLEGE! We rose to the challenge of representing a business and science college with the flash mob medium this year...twice! We particularly enjoyed creating the scenes shown at the end of this video...SO MUCH FUN! The MOST CREATIVE Surprise of 2017 - OUR LION KING THEMED PROPOSAL IN THE RAINFOREST CAFE! Our amazing animal costumes...zebra, lion, leopard, stag and bird! When a client knows EXACTLY what they want, it makes our job so much easier. Gareth had such a vision for what he wanted for his proposal to Daniel, that it made every element of planning this one a pleasure. We got to get more creative than ever on our costumes and facepaint, and our dance routine, a mixture of African and jazz, was so exciting to put together. A MUST WATCH - only viewable on a computer not on mobile, but trust me, it's worth it. The BEST NEWCOMER of 2017 - OUR SURPRISE SINGING WAITERS! Yes, we started our singing waiter team in 2016. But this year has been a fantastic year of growth for our 7 superstar singers - our acapella arrangements have gone to the next level and we've had some fantastic surprise performances for birthdays, weddings, and even were taken to Portugal to surprise the staff of Thomas Cook at their annual conference! We're really excited for next year to create even more acapella magic across the country. For more info about our singers and what makes us different, see our blog post about the team! The MOST COLOURFUL Mob of 2017 - RUBRIK'S EXCEL FLASH MOB! The MOST UNIQUE Flash Mob of 2017 - OUR DOUBLE PROPOSAL! Yup, you heard right. A DOUBLE proposal! We've done a whole standalone blog post about this one that can be found here, but this one is spectacular. Well done to Adam and Leigh who masterminded the whole thing together for lucky ladies Kirsty and Ella. It now has a whopping 45,000 views on Youtube so make sure you give it a watch! 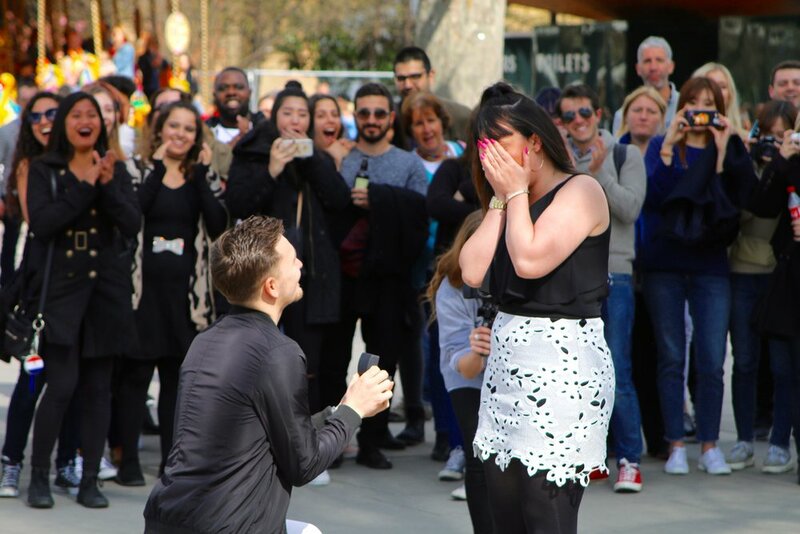 If you liked this one, check out our Runner Up, Vessko's proposal on the Southbank - not only did he add singers into the mix alongside our dancers, he enlisted a famous Bulgarian singer that his girlfriend loves, to surprise her right at the end. Such a good proposal, it even features THE LIFE from Dirty Dancing, and stands at 215,000 views on YouTube last time we looked! The SCARIEST FLASH MOB of 2017 - OUR HALLOWEEN 2017! When we were contacted to help promote the launch of the new Baywatch DVD with a classic Baywatch running surprise, we RAN at the chance. Check out these photos & video of our absolute BABES in action...HYSTERICAL. Robert and Sara are one of our favourite couples of the year. A beautiful pair, they met by the tills at IKEA 8 years ago, so Robert wanted to propose there...as strange as this sounds, it was spectacular! A big thanks to IKEA Wembley, who couldn't have been more supportive. This clearly has resonated with audiences, especially in the USA, as it's our most popular video EVER, with almost 800,000 YouTube views! So a huge thank you to all of our fantastic clients of 2017 - with almost 100 surprises across the country and beyond, we couldn't have mentioned everyone, but they all have a special place in our hearts. Stay in touch and keep surprising people...we know we will! How Much Do Singing Waiters Cost? In putting together our new Singing Waiter team in 2016, we realised just how difficult it is to get an idea of how much these types of surprises cost. So we decided to do some research and put together a little guide for you, not just on Club Mob's singing waiter team, but on the many available out there - to give you an idea of what to expect to pay, how services differ from group to group, and the right questions to ask when deciding who to choose. Our singing chef and waitress ended up having a hilarious riff-off using the bride's name, at this beautiful wedding! 1. What are you paying for? Make sure they take your full order for your special day! Make sure that your chosen company knows what restrictions your venue may have and what your exact requirements are so that they can quote you accordingly - and if you're not sure, it's best to have a 10 minute consultation over the phone so that they can use their expertise to ask the right questions, and possibly make suggestions that you'd never even have thought of! 2. What type of show are you looking for? Whilst all Singing Waiters have two things in common - they wait on you, then they sing - the type of singing show varies from one company to the other. This can also be affected by how many singing waiters are supplied - many companies supply one or two man shows, whereas others provide a trio or more. If you're looking to hire just one singing waiter, make sure you check out videos of your exact performer, so you know who you're getting - a lot hinges on the personality, showmanship and talent of that one individual! We provide a minimum team of 2 singers but believe the more the merrier, to provide some unique arrangements and lovely harmonies - not to mention the chemistry and fun had between the group. Some companies bring along a guitar and play the music acoustically (these types of acts are normally a little more comedic) and others will perform to backing tracks, which is good if you're after a very specific genre, or singing in Italian for example. Whilst performing to backing tracks makes tracks easily recognisable to your guests, a little more freedom is allowed when performing acoustically or acapella, so that the singers can change the music up and make it unique to your day! 3. How Much Are Singing Waiters? At the more affordable end, 1 standard singing waiter with equipment is likely to cost you between £500 - £900. Most companies charge between £900 to £1600 for 2 singing waiters, and at the higher end of the spectrum, a very established opera singing group is about £2300 for 3 waiters including equipment hire. 4. How Can I Stand Out from The Crowd? The singing waiter phenomenon has been around for years now - so when Club Mob decided to set up our own team, we didn't want to just copy everybody else. We wanted a challenge, and to play to our strengths, which was our creativity! And therefore an acapella group was born - and with the recent popularity of 'Pitch Perfect' and 'Pitch Battle' on BBC1, everyone is starting to see the joys of mash-ups, medleys and making songs your own with beatboxing and vocal harmonies. When we perform our 2 or 3 singer sets with guitar, we still change loads of the lyrics to be about the happy couple / birthday person / event guests, which always has everyone in stitches. We keep most of our surprise set modern and fresh, and then throw in a few oldies for good measure as you've NEVER heard them before - we've even been known to throw in a rap about the people we're surprising. We also include at least one song of your choice, arranged intricately just for you, into every performance. Give your guests a show they've never seen before! And because we know that we need at least 4 singers (including a beatboxer) to make it sound fantastic and make a huge impact, our prices begin at a competitive £1400 for our Pitch Perfect package. We also do a version of the set with guitar for those working with smaller budgets, with 2 or 3 singers. Prices for that start at £625 so let us know exactly what you're looking for an we'll happily provide a bespoke quote with advice about what will work best in your venue! We'd love to hear about your special event! Let's surprise all the guests and keep them talking about it for years to come... Get in touch using the form below or call 02078673769 today for some friendly advice. Please include the type of event, amount of guests you're expecting and any specific songs you might like! Wow. I need a vacation after the madness of May. With 11 performances across London, Manchester and further afield, it was unexpectedly our busiest month so far! Yep, you heard right! We did a mega 4 performances at Olympia's eHealth Week for the lovely people at UKCloud - and had a fantastic time. Check out the video here - complete with Casualty Theme tune....!! We've wanted to try this idea out for a while now! Our regular dancing waiters go out every ten minutes for a top-up in ghoulish make-up - subtle at first, and then more grotesque as the night goes on! We top the evening off by throwing some fake blood all over us and then making our full zombie entrance before performing our version of Thriller...it certainly got Barcadia's guests talking at The Museum of Science and Industry in Manchester! If ever a girl was to be treated like a princess, it was on the 20th May when Maung took Thu to Alexandra Palace for a walk. She had always asked him to buy a suit, and he never had - until today. So worth a watch, this surprise is so heartwarming! 4. 20th May - Zombie Waiters strike again! As cruise enthusiasts were about to board the Queen Mary in Southampton, the waiters and a few guests started to dance, and performed a musical in 4 minutes! The 400 guests were stunned, our broadway themed performance to the music from La La Land going down a treat - and to top it off, the routine is now a favourite with the whole of the dance team! We love flash mobbing for special occasions, and when Cat called us from Florida a week prior to her husband's last flight (he's a pilot for American Airlines) we were delighted to help her plan a fantastic retirement surprise! Staged in the lobby of the Holiday Inn in Kensington, the fantastic mob featured businessmen and flight stewardesses dancing to 'Come Fly With Me'...video coming soon...this one is not to be missed! 7. 25th May - Kings Cross gets mobbed! With most of our performances drawing huge crowds, an intimate, personal performance is actually quite challenging for us. But Adam wanted something really personal for Beth - and after telling me her favourite songs, I knew just the guy to bring in to help me make it special - Brad Ryan from Rotherham, who I worked with on a wedding earlier this year. With Sky Garden as the location, we created a lovely mashup of her favourites, finishing on Marry You - intimate though it was, Adam's work of hiding secret messages over the years in gift cards truly made this one epic. A must see video for any romantics out there, and a fab way to finish the month of May. Tune into the blog start of next month to see what we got up to in June - we've got Green Party politics, more La La Land adventures, private parties galore and a huge flash mob including singers and a musician playing alongside our dance team! Can't wait!! TO BOOK ONE OF OUR DANCING WAITER SURPRISES, OR FLASH MOBS FOR PROMOTIONS/PROPOSALS, GET IN TOUCH WITH ME ON 02078673769 TODAY. OR, FILL OUT OUR ENQUIRY FORM FOR A QUICK RESPONSE AND QUOTE! As the director of Club Mob, there's nothing I like more than proudly chatting about our recent surprises! So I'll be posting on a monthly basis about our recent work... if you've seen any of our April mobs, we'd love to hear from you in the comments section! The month started as it meant to carry on - with a proposal! Turns out April is the month of romance. And none more romantic than Bhav, who wanted to surprise Tina with her favourite song, sung by a talented 'busker'...she was given a rose and told she was the prettiest girl in the crowd before it started, but still had no idea that the whole performance, including a beautiful contemporary duet from Tom and Kalene, was all for her! Bhav, who lives in Rugby, had made a special trip into London just to use one of Club Mob's bespoke surprises in a great setting. 2nd April - The DOUBLE proposal! What an epic treat this was! 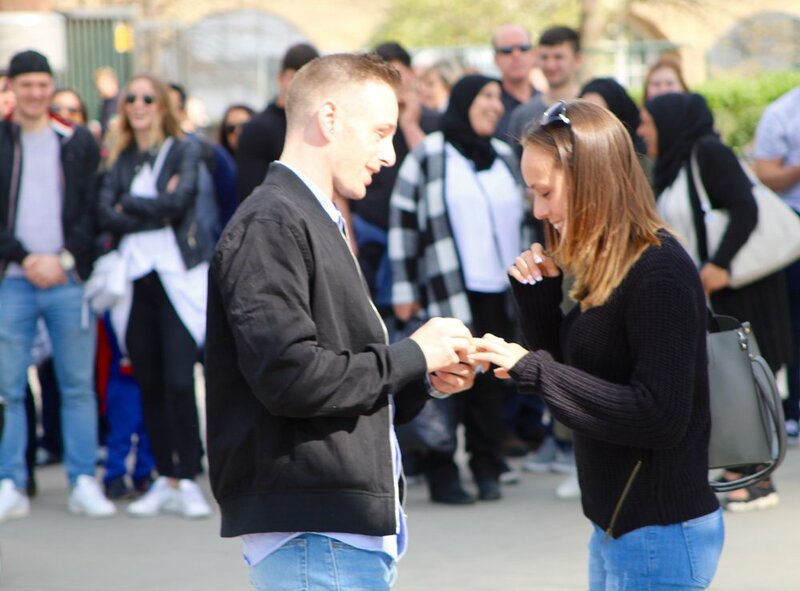 Leigh and Adam are best friends from Essex - and since their girlfriends are best friends too and they all do everything together, they also decided to propose together! For more backstage info on this one, check out our blog post dedicated to it! Apparently the 2nd April was a day for doubles - no rest for Club Mob! After the double success of our earlier proposal, it was off to Mayfair for a very fancy Bar Mitzvah celebration. Josh and Abi had no idea what their parents had planned - and the funniest thing was, the parents had forgotten they'd booked us until we spilled a drink and started our little 'scene'! It went down a treat with the kids, and ended with some great photo opportunities!! 8th April - A flash mob...in IKEA! I personally LOVE Ikea. And now that we've worked with them on this awesome surprise, I love them even more. Rob and Sara met in 2003 by the tills - so that's where he wanted to propose! No challenge is too big for Club Mob, so we got IKEA on board and made it happen. And did we have meatballs afterwards? Of course we did. I TOLD you April was all about the love! From one proposal to another, we went that evening to the Southbank, and with London Bridge as our backdrop, surprised another beautiful lady. We drew a huge crowd for this one, including some girls who sang along to Single Ladies at full blast! When Mike got down on one knee, he'd also arranged a 'Will You Marry Me' banner to be held by family and friends from a nearby balcony. Perfect. Who could say no to that? April 23rd - Our Dancing Waiters go UltraViolet!! We had so much fun with this Bar Mitvah's neon theme. UV paint, UV leotards, light-up caps...little Chase was stunned when the waitresses tipped champagne all over each other during his dad's speech...but of course this was all planned, the UV outfits revealed, and our hip-hop routine to Missy Elliott and Bruno Mars got kids and adults bopping along! 29th April - A very BAD Wedding! To finish April off with a bang, our Manchester team mobbed Tim's wedding - and as we'd taught them a Michael Jackson BAD routine in advance, the groomsmen got up with our team at the end and absolutely smashed it! Well done guys! Check them out!! Tune into the blog end of this month to see what we got up to in May - I can guarantee you doctor flash mobs, zombie waiters, and La La Land and Dirty Dancing antics! It's going to be our busiest month so far this year! I've been meaning to write this one for a while! A question we’re asked all the time, is how much our flash mobs cost. Most people have absolutely no idea - which is totally understandable, as you’ll probably only ever hire one flash mob surprise in your entire life! So this guide is intended to let you know what to expect when booking a flash mob or surprise performance. 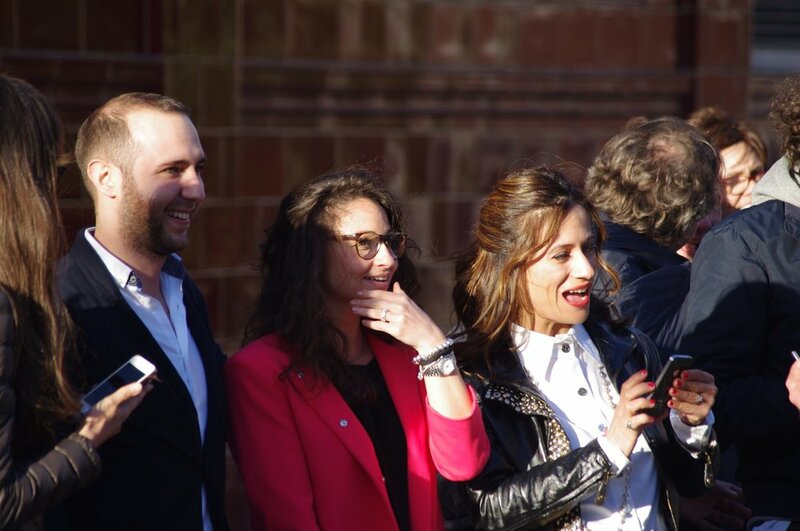 The reaction as one of our proposal clients joins in the flash mob! Since our work varies from small, intimate performances to huge, months-in-the-planning productions, it’s a difficult question to answer. 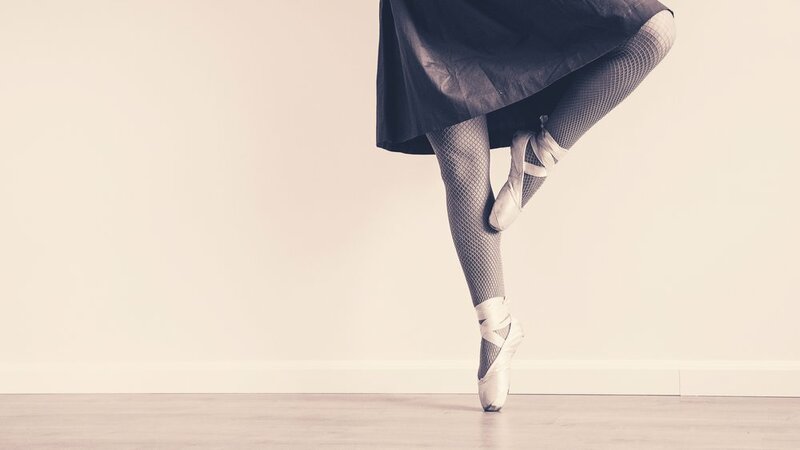 We pride ourselves on no two performances ever being the same, and we’ve built a team of the most skilled professional dancers, singers and musicians, who diligently plan and rehearse to ensure that ‘spontaneous’ performance is everything you envision and more. And that’s before we pay our dedicated dance/singing team that bring it all to life! A small surprise for a 50th birthday! BUT: the great thing about hiring Club Mob, is that you are working with the performers themselves, from start to finish. That cuts out the middle man and makes our group very competitively priced within the industry. And if your event doesn’t need 20+ performers, we won’t try and sell you 20! Our surprise dance act can still make a huge impact with one of our smaller teams, which suit most weddings and birthdays. It’s all about the quality! To give you an idea, most of our small surprises range from £600-1000. For one of our medium flash mobs, you would be looking in the range of £1000-1500, and for something even bigger, for promotions or an epic surprise, expect to pay upwards of £2000. Whatever your budget, we would love to create some magic at your event, so give us a call on 02078673769 to discuss options. Money saving tip: Get people involved! We can include FREE, fun, simple tutorials for friends/family/staff to join the end of your flash mob to make it even bigger, or, our Flash Mob Consultancy service helps you put on your own flash mob. We can provide choreography, rehearsals, video tutorials, logistical help and advice - all you need to supply are the people! 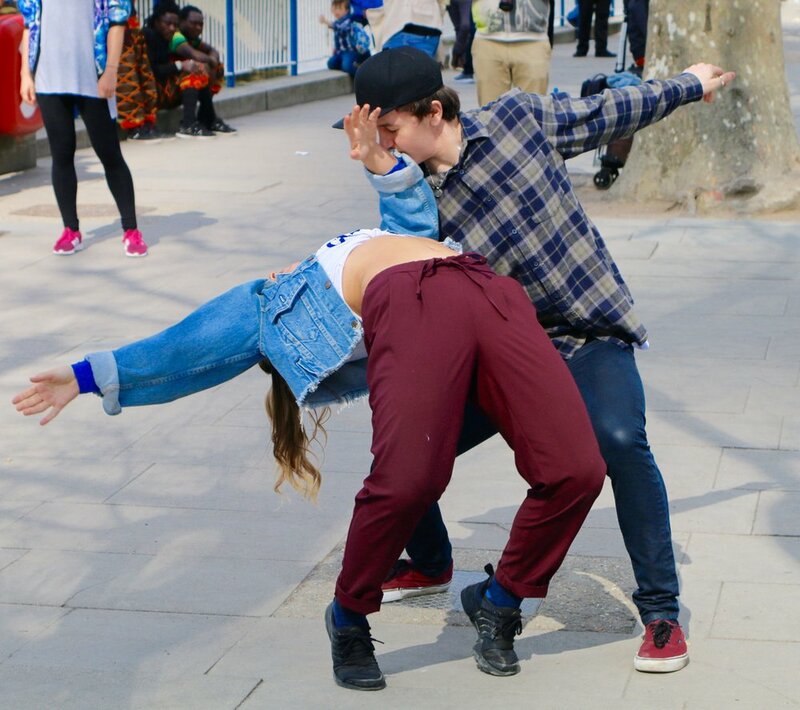 Our prices for Flash Mob Consultancy start at £330, so get in touch today. We got all the bride's friends involved, to make this one of our most famous flash mob on Youtube!